Bennett turned 1 on Friday! It was a bittersweet day for me. Bitter that he’s not a baby anymore, but officially a toddler and sweet that he is growing up healthy and happy. You certainly take the good with the bad as a parent. His actual birthday was spent at daycare. Mama and Daddy had to give the Benchmark Exam to our students. Bleh. But, I took cupcakes for his class, so he could celebrate with his friends at school. Yay! On Saturday morning, we threw a Star Wars party for him in the backyard. Friends and family were out in full force! It was beautiful weather, the food was delicious, and the company was even better. 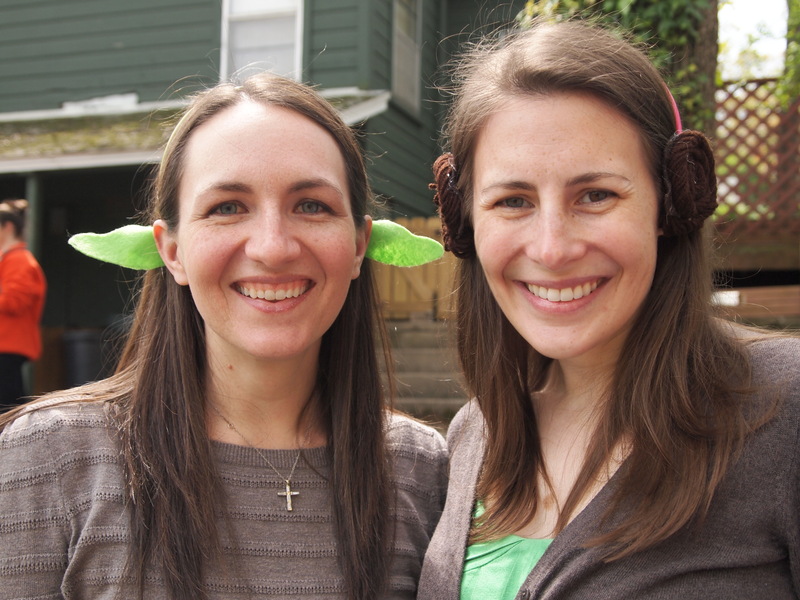 I made Princess Leia buns and Yoda ears for the party guests. I think the adults liked them more than the kids. As party favors, I made light sabers from coloring books. So fun and super easy. Bennett got a red wagon from his grandparents! The kids played in it the whole party and Bennett opened his gifts from the wagon. Everyone was so generous and brought Bennett some really wonderful gifts for his birthday. I know he felt special and celebrated. Thank you to everyone! Then, we had cake. Well, we murdered cake. Bennett takes no prisoners. The party was such a success. Not because the food was good or the decorations were adorable, but because it was all about Bennett. It was a celebration of my son’s first year of life. From getting up in the middle of the night and changing 12 diapers a day to crawling and feeding himself. It’s been a really good year. This entry was posted in Bennett and tagged 1st, backyard, birthday, cake, home, light sabers, presents, star wars, toddler. Bookmark the permalink. Happy Birthday to your little guy! LOL about what he did to that cake! 😀 The party looks like it was great fun.